No, Jimbo hadn't lied. His apartment was fantastic with a dynamite view of the city, sumptuous furnishings, and for the next 48 hours, mine all mine! 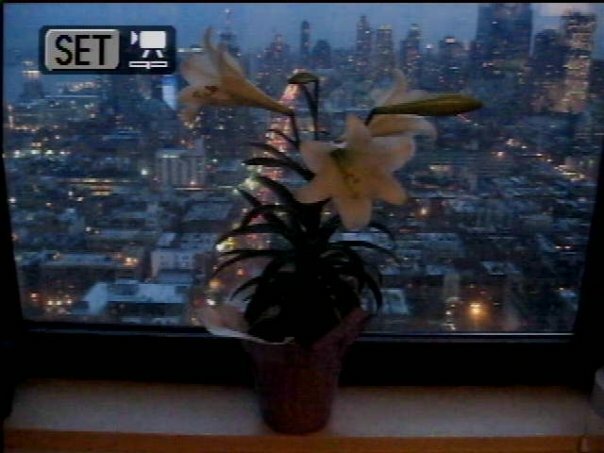 He'd even left sweet smelling fresh cut lilies on the window sill. "Hope you like my place," I said, turning the key at 2:00 A.M.
"Love it!" she squealed. "What did you say you do again?" "I'm a risk arbitrager. Or arbitrary risker, something like that. Now how about we get ...."
"OH, NO, LILIES! I'm very allergic!" "Well, we'll just get rid of them then!" "AHHH-CCCHHHOOO!!! No, once I'm exposed, I'm a mess for the next 48 hours!" Picture prompt above, story below, and at 107 words I'm not too far off the pace of 100 this week and nowhere near as far off the pace as I was with the abortive seduction of some years past sadly recounted herein. This is my weekly contribution to the Fabulous Flying Friday Fictioneers and Lily Lover Legionnaires Association. Click the link when you're ready to spend 48 hours or so enjoying the posts of the other Fictioneers/Legionnaires, each and every one of which is nothing to sneeze at. Sorry, got to go now. I've a lot of arbitrary risking to do if I'm ever going to afford my own place like this! Ha! Just desserts. Nicely done Perry. Methinks the man needs to get his pickup lines in order aside from the lily faux paus, that is. Funny. Don't know what Jimbo does; Perry is just trying to impress what's-her-name with whatever supposedly high flying profession he can think of at the moment. Just desserts? I didn't get my dessert! Of course, this happened some years ago. My pick-up lines are much better now. Lillies make me throw up. Ok, they don't. It just seemed a fitting thing to say. Very cool flash fiction. Nice job! Thank you, June. After a lifetime of misadventures like this, boy do I need a good shrink! I hate when that happens! Better luck next time! Once again, romance was not in the cards. Perhaps you should just forget romance and take up cards. Have some guys over, order a pizza, pick up a case of beer and some cigars. A little cigar smoke will teach those damn lilies to mess with your lovelife. I want to know why everyone assumes this story is about you??? :-) Enjoyed it, no matter who the main liar, I mean, character is. The risk caught up with him. And I love the name "Jimbo", which is perfect for this story. He didn't assess the risk of the lilies I guess. You never know what will be the downfall of such carefully laid plans. He gets what he deserves. Good story. OUCH!!! Oh, OUCH!!!! Perry, my man, I haven't seen a scene that put SO much of a damper on things since Karen Allen's line in Animal House, "I'm only thirteen!" This one made me laugh - I'm allergic to pretty much everything so I empathise with the girl in your story! Haha..that’s what you get, you scoundrel! I wonder if his friend was playing him a prank... that was a great story. Yeah, that sounds pretty good, but then I turn on TV and there's some gorgeous newsbabe or hot actress and I think "why can't a balding 62 year old guy with not a lot of money who writes a blog that nobody reads" nail her, and I'm off and running again. Well, the story didn't actually happen of course, but the characterization of inept me trying to carry out seductions (even at a much younger age) is pretty much on point. And yes, I did pick the name Jimbo as a nickname for someone who's pretty cool with the ladies. Hm....I would be suspicious of his drama. I've heard of plant allergies but never from Lilies...ah, well. A fun read. where's the benydryl when you need it ? It made me smile. I had to come back, this reminds me of a true story from long ago where a friend borrowed a fancy car for a date, but on the way to pick up the girl he ran over a skunk. No parking in that car. Karen Allen is one of my most longstanding failed fantasies. Thanks for bringing it all together! Empathize with her? You're supposed to empathize with me! Scoundrel? No, it's would-be scoundrel! That would be just like that damn Jimbo to hire a bogus woman to pretend to like me and come back with me to his apartment and then feign incredible allergies to lilies! Think he got the idea from the plot of Vertigo. I dunno. Since then I've kind of avoided lilies too! Don't you remember? I told you that story. That happened to me too! this has been my best read so far with last week's picture! Nice! That's a comment for all seasons! Thank you. LOLLL!!! Darn! I feel for him!